Worth the Wait? : Billions of dollars used for high-tech security equipment was supposed to serve the 'dual-use purpose' of preparing first responders for natural disasters as well as terrorist attacks. But New Orleaners like the ones shown here waiting to be rescued after the hurricane quickly learned that the government's 'responders' were caught unprepared. Greed, incompetence and stupiditywho says the Bush administration doesn't have a disaster plan for New Orleans? 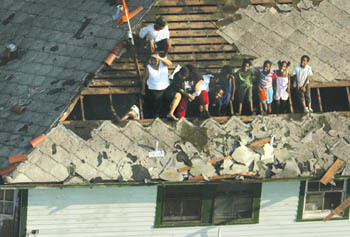 IT IS Saturdayfive days after Katrina. In New Orleans, Malik Rahim is without electricity, running water, medicine or real food. But he is dry, and his telephone works. Rahim, a community organizer, lives in the Algiers District, which escaped the flood. When soldiers brought a modicum of relief today, courtesy of a politically spooked president, Rahim must use precious gasoline to drive a dozen miles for food and water. The troops do not want to rumble through Algiers, a largely black neighborhood near the central city. "There is a dawn-to-dusk curfew here," says Rahim. "Vigilante whites are riding around with shotguns. Blacks are lying dead in the street." Rahim ran for Congress on the Green Party ticket earlier this year. He asks that people come to New Orleans to rebuild the neighborhoods. He wants to start a "Green Cross," since the Red Cross is not to be found anywhere near Algiers. Rahim's pal from San Francisco, antiwar activist Gloria LaRiva, heard his call. She managed to evade the military blockade of New Orleans on Saturday, arriving in time for a banquet of Meals Ready to Eat. LaRiva gets on the line: "There are convenience stores with broken windows from the hurricane and food on shelves. But no one dares to enter them for fear of being shot." We talk about three years ago, when the Times Picayune detailed just how unprepared the government was for dealing with a major hurricane in New Orleans. Emergency planners knew that levees were antiquated and unstable, that a toxic storm surge could kill thousands and that 100,000 impoverished blacks would not be able to evacuate from New Orleans. Neither the city of New Orleans, the state of Louisiana, the Department of Homeland Security nor the Red Cross had real plans to house, feed and provide medical care to disaster victims, said the Picayune. Lloyd's of London, famous for insuring any risk, wrote off New Orleans. A real estate expert told the newspaper that thousands of homes and businesses would be seized by banks when refugees missed loan repayments. "The banks will ... resell that space. It will all be [at] fire-sale prices, and it will end up ... owned by different people." It is not hard to see that the Bush administration has seized upon the disaster to reinvent New Orleans. For years, Bush assured Americans that spending billions on high-tech security equipment (like hazardous-material protection suits, biowarfare air sniffers and airport scanners that do not work) serves the "dual-use purpose" of preparing first responders for earthquakes, hurricanes and floods as well as for terrorist attacks. The disintegration of the federal government's civilian and military emergency-response network in the wake of Katrina demonstrates that the revolving-door corporate officials running the Bush administration are not only arrogant and venal, but worse, they are amazingly incompetent when it comes to actually doing anythingexcept handing out talking points to lazy reporters while their former employers pocket war and, now, disaster profits. The Bush administration has, through disingenuousness, greed and stupidity, not only paralyzed the ability of the United States to effectively wage ground wars abroad, it has also broken the back of the military's usefulness as domestic first responders. Take the Northern Command, which was mostly absent from the Gulf Coast until nearly a week after the levees broke. As I reported in the May/June Mother Jones, the Pentagon's newest combatant command covers North America with a blanket of surveillance. It has the power to take control of every national guard, reserve and active-duty military unit in the countryupon order of the White House. NORTHCOM has the authority to deploy hundreds of thousands of troops, hundreds of huge transport planes and flotillas of heavy helicopters. It has stocked military-base depots with emergency supplies and construction equipment. It is (supposedly) able to leap into emergency relief work at a moment's notice. At its headquarters under Colorado's Cheyenne Mountain, NORTHCOM "fuses" state-of-the-art intelligence data gathered from ground sensors, government and commercial databases and spy satellites into a virtual reality map it calls the "battle space." And yet, according to a representative, NORTHCOM was "not aware" that thousands of people were trapped for days inside the New Orleans convention center. Nor did the powerful command unleash its fleets of Starlifter and Hercules cargo planes and Chinook choppers and ultracool communications systems to come to the aid of city and state responders as they were overwhelmed by Katrina and its deadly, silent aftermath. After New Orleans Mayor Ray Nagin gave his expletive-laced, no-nonsense radio interview chastising Bush for inaction, NORTHCOM jumped to attention. The feds started blaming the governor of Louisiana for not relinquishing her emergency authorities to Bush. Bureaucratic niceties aside, the most probable reason that NORTHCOM and the National Guard troops of the affected states sat quietly by as Katrina smashed the Gulf Coast is they were being held in reserve as a fighting force. When NORTHCOM assumes operational control of National Guard units, those soldiers lose their police powers, i.e., they can no longer enforce laws, make arrests or shoot civiliansall they can do is combat foreign terrorists, or perform relief work. As the black people of New Orleans swam around in sewage on international television, Bush refrained from mobilizing the government's most powerful emergency response and humanitarian-aid tool, reserving it, instead, for potential combat inside New Orleans, Biloxi and Mobile. In one fell moment, all the government propaganda about how the Northern Command is able and ready to defend Americans against natural disasters was unveiled as cant. Amazingly, Bush has yet to utilize the full emergency-assistance capability of the Northern Command by "federalizing" the National Guard, which is, therefore, still empowered to shoot people foraging for food and to forcibly remove people from their homes and ruined businesses. National Guard units from a score of states are fragmented under multiple commands instead of reporting to the military nexus at NORTHCOM where, in theory, they could be efficiently used to save lives and property. It is clear from news reports that the rescue effort is anarchic and piecemeal. As the political backlash mounts, Bush takes personal responsibility for the ill-prepared and horribly executed emergency response. But more than a politically contrite Bush is needed to reverse the situation. His resignation would be helpful. There is ample reason to impeach him, as well. Under the National Response Plan issued in December, the president holds incredible powers to mobilize the armed forces as emergency responders. He did not use these powers. The president's authority is backed up by operations guidelines laid out in the Pentagon's Homeland Security plan, which went live on Aug. 2. It is clear from these public documents that through NORTHCOM the president can instantly take control of the military and National Guard and save lives at the scene of a natural or man-made disaster. Plus, under catastrophic circumstances, the National Guard units of 50 states can temporarily be wielded as a single unit for both emergency relief and law-enforcement purposes (losing the latter power after a few days). Yet this was not done. There is probably more than one explanation. Aside from keeping many disciplined military units out of direct disaster-aid work so that they would be available to attack a "civil disturbance," the White House may believe that NORTHCOM is not in any better organizational shape to handle an emergency (or a terrorist attack) than is the insanely ill-prepared FEMA to fight a hurricane, flood or earthquake. Of course, if Bush had the moral sense God gave a flatworm he would not have invaded Iraq and decimated the ranks of domestic first responders. And now as his war on Iraqi civilians flounders, government studies show that corporate war profits are dwindling. The Gulf Coast is panning out to be the savior of Halliburton, Lockheed, Bechtel, Perini Corporation and the whole gang that has been so merrily building Bush's Oxymandian project in the Middle East. Tens of billions of dollars in no-bid contracts are being handed out like cocaine lollipops to corporate crack babies. Federal wage protections have been lifted so that Halliburton et al. can pay the local blacks and Mexicans less than usual and walk away with the difference. The military is conveniently on hand to expel anyone who objects or who wants to stay on their land, flooded or not. The black population of New Orleans is being relocated en masse, and Barbara Bush has the nerve to say that losing their homes is in their best interest. As we go to press, at least one Orleaner is making a stand. "I am not leaving," says Malik Rahim. Watch your back, my friend. I doubt that help is on the way.